Fighting Irish Thomas: Parable of the "prodigal papa": Michael D. O'Brien's "The Father's Tale"
Parable of the "prodigal papa": Michael D. O'Brien's "The Father's Tale"
There are no perfect parents in this world, Andrew. None. We all make our mistakes, and we leave marks and gaps in our children's lives. But we do love them--imperfect love, as all human love is. Then, when children become adults and have their own families, they begin to understand. They in turn learn the need for forgiveness. In prison I learned to forgive my own father, and saw that he needed to forgive his father. No one is exempt from this. It goes all the way back to Adam and Eve. You're saying that you want me to forgive you...the best father in the world? On one level, The Father's Tale is "merely" an epic re-telling of the parable of the prodigal son, but with a modern twist. Instead of waiting patiently for his son to return home, the introspective (and increasingly reclusive) bookseller Alex Graham, when confronted with the fact his Oxford-attending son Andrew has left school to join a cult, leaves his modest but comfortable Canadian existence to pursue his lost lad, only to "find" himself (literally and figuratively) on a nearly year-long journey leading half way around the world. As he does, the novel really becomes three books, turning from the prodigal son parable into a romantic love story (with a Russian heroine at that) then to a cloak and dagger spy saga (when Alex Graham is mistaken for "Agent Bell") and finally, with a surprise reversal not seen this side of "Huck Finn," back into the parable again. As with all of O'Brien's novels (but even more so in this one) you not only get drawn into the characters but you personally feel their pain; you cry when his son abandons his faith, are disappointed that the Russian relationship doesn't end in marriage, pray that Alex doesn't have to undergo torture at the hands of the Russians (or Chinese) and rejoice when the prodigal(s) return. But mostly, if you are "Catholic" (either in sacrament or spirit) you are sad when the novel ends, for you know with certainty there is not another book on earth that can take its place. Then the long courtship full of hand holding and brief, discreet kisses. The thrill of praying beside her at Mass, knowing that their souls were uniting, knowing that the reined passions would be released on the wedding night, when they, like two deer maddened by love, would dance in the holy forest under skies crammed with singing stars. A great joy was hidden in their longing. He and Carol discussed it often, murmuring consolations and reminders, waiting together for the sacrament, as love deepened and deepened until it seemed there was no bottom to the reservoir. When the reservoir fountained at last, there was no holding it back; it became a river, became a flood, then spilled into the oceanic cosmos of supernatural love, natural and supernatural flowing together in potent-fertile joy. They drowned in it and were born. How poor were the tumbled metaphors with which he had sought to express something that was—was everything: the mystery of love. The dance of love. The sea of love. The kingdom of love. The night Jacob was conceived, the night Andrew came into existence. The countless tender moments. The fire that burned but did not consume, two small flames that filled the whole realm of their covenant, uniting into a single flame that was greater than the sum of its provinces. They had no need for lands, or money, or power. Their bed was consecrated and joy filled; its four posts were the quadrants of the world’s compass, their quilted blankets a domain spreading from horizon to horizon. Prayer was the atmosphere of their kingdom. Their children were conceived in prayer and born in prayer. Carol had died praying, held in his arms and enfolded in his prayers. Birth and death had been suffused with grace. And because that was true, Alex now reminded himself, even the darkness was enfolded, even the loss and the abandonment, and the falling through the ice of the solid world into the desolation beneath (pgs. 291, 292). Alex lay back and let the Presence radiate from the center of his chest to every soul of his body. As he was enveloped by the sweet burning in his heart, all fear departed. His thanksgiving was wordless and clear. Drifting deeper into the state of inner rest...he sensed his prayer was rising into the chorus of praises from the countless martyrs of China and their angels and was joining the pleas of all the Communion of Saints [including] the greatest one, the Lady crowned with twelve stars (pg. 982). As stated earlier in this review, I was disappointed that the romantic relationship between Alex Graham and the generous-but-agnostic Irina Filippovna didn't blossom, but I reluctantly trusted the author's insight that her continued refusal to embrace Christ spelled its doom. Apparently, O'Brien had something better in store for the widower Graham all along, for when finally Alex returns home, a new mate for the renewed bookseller begins to emerge...on the very LAST PAGE of the novel! Even for an Irishman, this extreme amount of romantic teasing is completely unacceptable, and to paraphrase Cardinal Francis George's criticism of Barack Obama's sleight-of-hand slight of the Catholic conscience with his heathen healthcare plan, I cannot and will not stand for it! For the good of all the new fans this review has brought you, I hereby order my Canadian friend back to his computer to write a follow-up novel, where we find out how Alex and his new wife fight against the returning president, or the secretive Mormon, or (hopefully) joins forces with Bella and her proud Pennsylvania papa, whatever the case may be. On the other hand, we have a few months before we find out how this story all turns out, so I guess your best move right now is to spend (even) more prayer time in front of the Eucharist. Something tells me, Michael, that the United States (and the whole world) is going to need it. P.S. 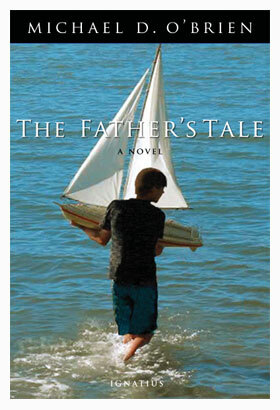 Although I went "old school" and read A Father's Tale from an actual book (I renewed it from the library twice!) I'd like to thank Kevin O'Brien (no relation) for sending me the complete version of TFT on tape. If tapes are a better option for you to hear this "tale," please contact Kevin at 1-888-840-WORD or through his Theater of the Word website or facebook.